Welcome back to part 3 in the Project Planning Series. If you haven’t had the chance to read part 1or part 2 then please do so, answer the questions on both parts then come back here to finish the final part 3 and get your project DONE! So in part 1 and 2 we have defined what project we are starting and we have taken a real look at *why* we haven’t got the project done yet. Today we will finally make it doable! By breaking the project down into easy manageable steps and by adding these steps down into our planner. In part 2 you found out the REAL reason behind not accomplishing the project and now you can work around it and/or completely get rid of those reasons stopping you. Here are the steps we will take to get things done. The most important part here is to plan realistically. There is no point planning it in if you know your week will be full to the brim. If you have too much on your plate then it will not get done. 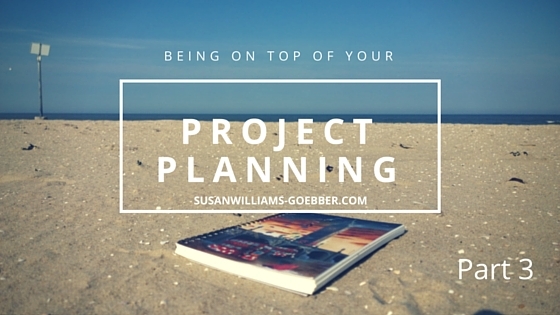 You will be putting yourself under a lot of stress if you try to add your project in without taking something out of your planner/life first. At the end of the week/month, you will just feel like a failure. So please be realistic and kind to yourself when setting up the deadlines and your new routines. Extra tip: A safe way to avoid the trap above is by leaving some wiggle room as you plan your days. How is your routine going to look like now that you are committed to finishing your project? Please answer the Q right below, I would love to hear your views. I know I’ve fallen into the trap of making unrealistic plans. After many moments of disappointment and exhaustion, I’ve realized that it’s great to feel ready and determined to fully commit to accomplishing a goal, but without a realistic step-by-step plan (and wiggle room! ), my commitment quickly fizzles out. I’m so glad you liked it. Never forget the wiggle room, it’s good to have air to breath. Keep up the good work on reaching your goals.